Tanzania is a country of natural beauty, fantastic wildlife, beaches, ancient towns, archaeological sites and geological wonders. This safari visits some of the highlights of Northern Tanzania. On arrival at Kilmanjaro International Aiport you will be transferred to your lodge close to Arusha. Relax and enjoy dinner at the lodge. Arusha is the safari capital of Tanzania located at the foot of Mt. Meru, close to Mount Kilimanjaro, the Manyara, Tarangire and Ngorongoro National Parks. From there it’s only a short trip to the Serengeti. Just to the north, on the slopes of Mt. Meru is the Arusha National Park. Built by the Germans as a centre of colonial administration because of the temperate climate, Arusha is a good spot to take a day or two off from your safari. After the Serengeti, Tarangire has the greatest concentration of wildlife in Tanzania and in the dry season the Tarangire River is a magnet for thirsty wildlife. Large herds of Elephants and migratory Wildebeest, Zebra, Buffalo, Impala, Gazelle, Hartebeest and Eland gather and not surprisingly the predators follow. This is also the one place in Tanzania where dry-country antelope such as Oryx and Gerenuk are regularly spotted. Tarangire is also known for its spectacular Baobab trees, and its breathtaking views of the Masaai Steppe and the mountains to the south. 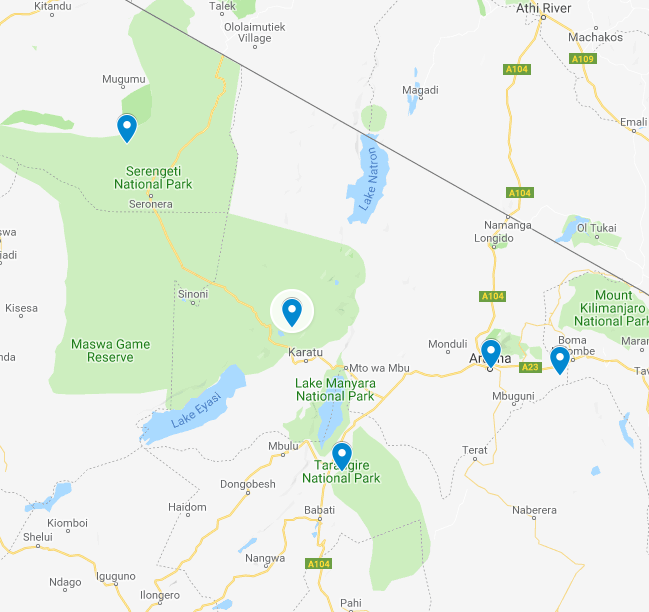 Located just a few hours drive from the town of Arusha, Tarangire is a popular stop for safaris travelling through the northern circuit on their way to Ngorongoro and the Serengeti. The park extends into two game controlled areas and the wildlife are allowed to move freely throughout. The Ngorongoro Crater is game viewing gone crazy and it is not surprising that with is one of Tanzania’s major tourist drawcards. Within the crater rim a daily wildlife drama is played out as large herds of Zebra and Wildebeest graze nearby Lion, Leopard, Elephant and Black Rhino. Outside of the crater a similar drama continues in a more spread out manner with Masai herdsmen thrown into the mix. The Serengeti together with Kenya’s Masai Mara Game Park form Africa’s most famous wildlife park. The image of Acacia trees on an endless grass plain epitomises Africa for many, and then add a Masai warrior and some cattle to the picture and the conversation need go no further. The annual Wildebeest migration through the Serengeti and the Masai Mara is the largest mass movement of land mammals on the planet – with more than a million animals following the rains. But that is not where the game viewing ends; large prides of Lion, Elephant and Giraffe in grasslands, Gazelle and Eland to mention but a few. Aside from traditional vehicle safaris, hot-air ballooning over the Serengeti plains has become almost essential and you can even do a horseback safari. On your last day you will game drive your way out of the Serengeti and be transferred back to Arusha and onto Kilimanjaro Airport. Extensions to Zanzibar and Kenya can be arranged.